As discussed previously, the decision to leave your employment is a very tough one – you have to make sure you are making the right decision for the right reasons. But whatever that reason is, you should still require a Resignation Letter. Here are some samples of the types of letters you can use…. Always include your full name, address and contact details at the top, right hand side of the letter. Include your last working date if applicable to the reason of you leaving. 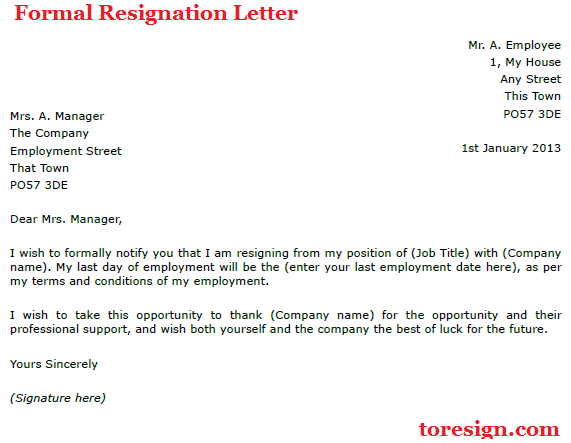 Your resignation letter should be brief and to the point. When to Include a Reason. 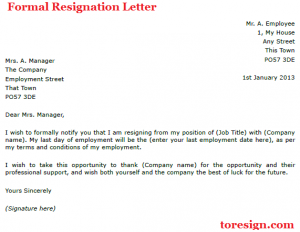 There are many reasons to cause a person to resign, and for some of these, there could be the necessity to include that reason within your letter. These are included within the following example letter. I wish to formally notify you that I am resigning from my position of (Job Title) with (Company name). My last day of employment will be the (enter your last employment date here), as per my terms and conditions of my employment. I wish to take this opportunity to thank (Company name) for the opportunity and their professional support, and wish both yourself and the company the best of luck for the future.